You are here: HomenextTopicsnextViews of the city: images & opinionsnextMystery photos of Brighton and HovenextIs this St Luke's School? This photograph was sent in by Peter Guy and is one of a collection he has of his late wife Brenda. In the photograph Brenda is first left front row seated. Peter thinks it is St Luke’s primary school as Brenda lived in Freshfield Road at the time. Do you recognise yourself or anyone else? If you can help, please leave a message below. 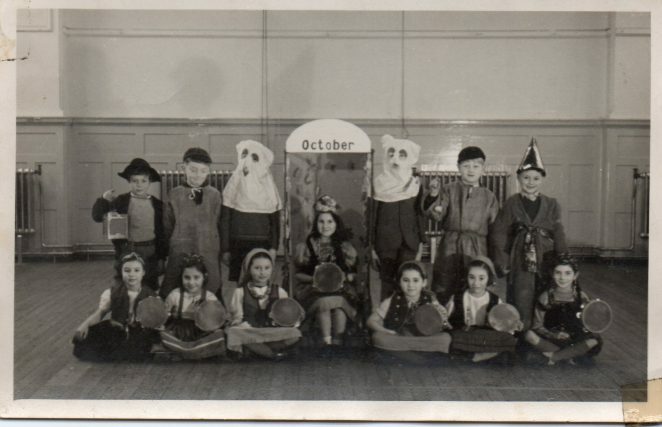 Elsewhere on this site, someone has posted a class photo of 1967 at St Lukes. It looks like exactly the same background. I am very pleased that my picture has been confirmed that it was St.Lukes school. My late first wife was Brenda Grossberg and she and her family lived in Freshfield Rd. from 1944 to 1951. She was born in 1944 so this picture is probably around 1950.